For fighter info, see King K. Rool (SSBU). King K. Rool's artwork from Donkey Kong 64. King K. Rool (キングクルール, King K. Rool) is the main antagonist of the original Donkey Kong Country series and several Donkey Kong spinoff titles and the arch nemesis of Donkey Kong and Diddy Kong. King K. Rool's artwork from DK: Jungle Climber. 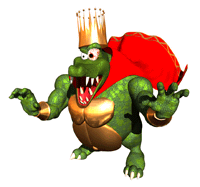 King K. Rool is the leader of the Kremling Krew, and King of the Kremlings. King K. Rool, like his spiritual predecessor Bowser, is a sinister, boisterous, overweight reptile who antagonizes Donkey Kong, much like how Bowser antagonizes DK's former rival Mario. However, while Bowser is a turtle-like chimeric monster who has frequently wavered between friend and foe for the Mario Bros. and is respectful towards his minions, K. Rool is an anthropomorphic crocodile, is consistently presented as a threat to the Kong family's safety and way of life, and mistreats and berates his minions. K. Rool is the main antagonist of most games in the Donkey Kong series and the archenemy of Donkey Kong and Diddy Kong, making his debut in Donkey Kong Country as the final boss. In that game, he steals Donkey Kong and Diddy Kong's banana hoard for unknown reasons, but two official reasons given are either that he likes bananas, or he's stealing them in order to starve Donkey Kong and Diddy Kong and occupy their treehouse. He made his return again in Donkey Kong Country 2: Diddy's Kong Quest as pirate captain "Kaptain K. Rool", where he kidnaps Donkey Kong and demands the Kongs' banana hoard for ransom, but Diddy Kong and Dixie Kong instead go to his home island, Crocodile Isle, to rescue him. Donkey Kong Country 3: Dixie Kong's Double Trouble! has him assume the alias of mad scientist "Baron K. Roolenstein", as well as kidnap both Donkey and Diddy to power his robot KAOS, in a bid to control the Northern Kremisphere; Dixie and Kiddy stop these plans and free Donkey and Diddy. In Donkey Kong 64, he reappears in a new mechanical version of his old island, plotting to destroy DK Island with his Blast-O-Matic, but it gets damaged on arrival. He thus has Diddy, Lanky, Tiny, and Chunky captured, as well as Donkey and Diddy's banana hoard stolen again, to buy time to repair the weapon. Once the Kongs disable it, K. Rool flees, but crashes his airship on DK Island, where the final battle, an extended boxing match where he goes by "King Krusha K. Rool" (with a typical champion boxer getup), takes place. He also appears in the Donkey Kong Land series, in similar roles to their SNES counterparts, as well as DK: King of Swing and DK: Jungle Climber. However, he did not appear in either game of the revived Donkey Kong series (Donkey Kong Country Returns and Donkey Kong Country: Tropical Freeze), and neither do his Kremlings. King K. Rool appears as a trophy. King K. Rool trophy in Melee. The demented head of the Kremlings and big boss in the Donkey Kong series. K. Rool is a giant, greedy glutton with a serious eye tic. While he fits the evil boss mold nicely, he's just enough of a bumbler to have gained a few fans over the years. His plan to blow up the DK Isles with his Blast-o-Matic shows how unbalanced he is. 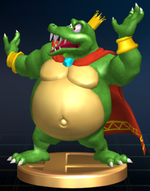 King K. Rool appears as both a trophy and a sticker. The King K. Rool trophy is unlocked by clearing Target Smash level 4 with all characters. King K. Rool trophy in Brawl. The supreme commander of the Kremling Krew. King K. Rool steal bananas from Donkey Kong and ends up kidnapping Diddy Kong. He is so good at playing dead that sometimes the credits even roll as he lies there, feigning defeat. His brother[sic], Kaptain K. Rool, made an appearance in the game Donkey Kong Country 2: Diddy's Kong Quest. Mii Brawlers dressed as King K. Rool. 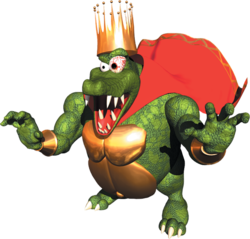 King K. Rool is the basis for a paid downloadable content costume for Mii Brawlers, released as part of the third wave of costumes. The costume mixes elements from his older and newer designs. The King K. Rool trophy appears in both versions of the game. King K. Rool trophy in Super Smash Bros. for Wii U. King K. Rool trophy in Super Smash Bros. for Nintendo 3DS. Whereas Mario often squares off against Bowser, Donkey Kong must fight against King K. Rool. He's a big croc with a big attitude...and a tiny crown. He probably could have been Donkey Kong's most trustworthy animal friend. Think he'll ever have a change of heart? Not likely. This guy is to Donkey Kong what Bowser is to Mario. This crowned Kremling has a serious attitude problem. If only he could have been one of DK's Animal Friends instead... Maybe with just a little change of heart, he still could be! On second thoughts...nope. Never gonna happen. King K. Rool, as he appears in Super Smash Bros. Ultimate. King K. Rool was announced as a playable fighter for the first time in an Ultimate-centric Nintendo Direct on August 8, 2018. K. Rool is the first character in Link's Classic Mode character unlock sequence, and as such can potentially be the first character to be unlocked. His design is largely based on Paon's post-Donkey Kong 64 redesign of the character. However, his gold-plated belly and waist-long cape, are based off his appearance in the original Donkey Kong Country. His more pronounced scales are original to the Smash Bros series. During certain attacks, he dons outfits as references to several games, such as his "Kaptain K. Rool"'s pirate hat from Donkey Kong Country 2: Diddy's Kong Quest during Blunderbuss, and "Baron K. Roolenstein"'s Propellerpack from Donkey Kong Country 3: Dixie Kong's Double Trouble!. King K. Rool’s inclusion was largely facilitated by popular demand within and outside of the Super Smash Bros. Fighter Ballot. In an interview following the August 2018 Smash Direct, Masahiro Sakurai revealed that the development team used the survey as reference for choosing newcomers and that King K. Rool was a massively popular choice in the poll. He said that it would be better if he left the moveset to the player’s imagination at the time of his reveal, but specified that to maintain his likeness that he would be standing upright, even if he will appear smaller than usual. While King K. Rool has had a voice actor in his own series, with his current voice actor being Toshihide Tsuchiya, Super Smash Bros. 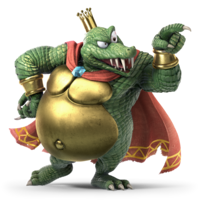 Ultimate does not give King K. Rool a voice actor, instead giving him realistic crocodile grunts and roars, similar to his appearances in some Donkey Kong games such as DK: King of Swing for the Game Boy Advance. The same thing happens to Donkey Kong, who is given relatively realistic gorilla grunts rather than using Takashi Nagasako's voice clips from other games; Diddy Kong, who uses realistic chimpanzee screeches instead of using voice clips from his current voice actor Katsumi Suzuki; and Bowser, who uses realistic roars instead of his current voice actor in the Mario games, Kenny James. Although King K. Rool's name is the same between Japanese and English, the announcer pronounces it differently between regions: the English version pronounces it as "King Kay Rool", while the Japanese version pronounces it "King Cruel", which is the basis of the pun on which his name is built. King K. Rool is the only playable Donkey Kong character whose onscreen appearance does not involve him jumping out of a DK Barrel. King K. Rool is the third character in the Super Smash Bros. series to be created outside Japan and the second character to originated from Europe. This page was last edited on April 17, 2019, at 11:22.